Paint booth water treatment is crucial to keep the water curtain clean and guarantee optimal retaining of the overspray. As a chemical products producer for water treatment, NISKAE offers a complete range of formulas for paint booth water curtain treatment. We adapt our coagulants and flocculents specifically to your paint, whether it is solvent or water-based. In general, coagulation is referred to as a artificial, forced flocculation of tiny particles and very tiny particles called colloids; by measures that force the growth of the particles. NISKAE’s coagulants 1000-1099 is a range of liquid products made for water treatment and wastewater treatment that turn matters into flocs and make water separation possible, or by amplifying the electric load. Because of their neutral or not so alkaline nature, NISKAE’s products make the solvent loaded paint particles (that come from a water curtain equipped paint booth, with “overspray”) and other organic or inorganic particles coagulate. After the coagulation, suspended particles flocculate and the solvents in the circulation water link up by absorption. 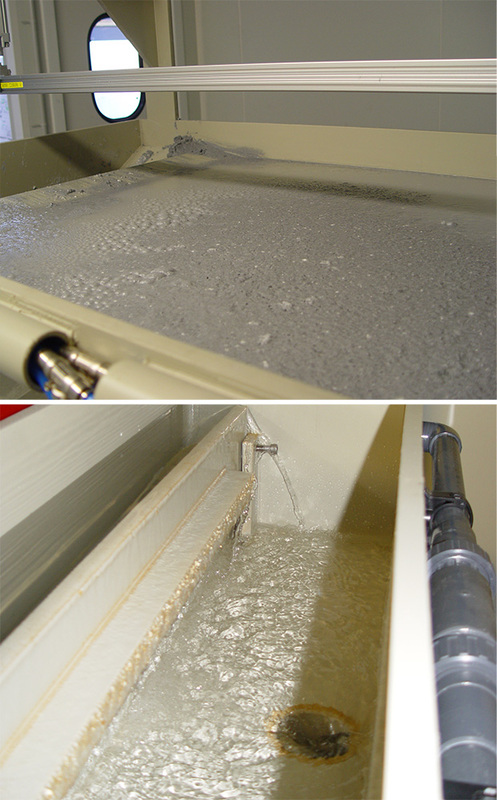 Our skimmers for paint sludge extraction get rid of coagulated paint particles by aero flotation and surface scrapping. An industrial test on site, with the set up of a pilot unit or by adding our products to your paint sludge extraction system. A turn-key custom-made complete dosing unit with a preparation tank, and a set of dosing pumps. Follow-up and customer service for your installation and equipment by our technicians.